Shares her expertise during The Science of Soap Making presentations held at the Main, Gordonsville and Wilderness branches of the Orange County Public Library. 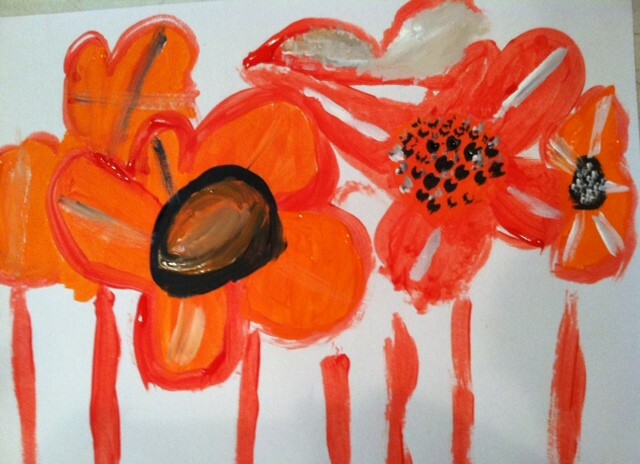 Held at Fox Trail Assisted Living, with artist Carol Barber teaching during the evening class. Through sharing various acrylic painting techniques, Carol encouraged the group to find their own style within the Vincent Van Gogh study. Dogwood Village -Senior Living residents visit the Morin Gallery at The Arts Center to view the “In the Heart of the Wood” exhibit. Self Portraits in Chalk Pastel, created by members of Friendly Oaks, a psycho-social day program for adults. Pear Still Life, taught by artist Carol Barber, was the subject for the acrylic painting exploration during the art session held at each branch of the OC Public Library. Officers of the Orange County High School FFA donate wooden boxes designed especially for the Community Outreach Program. Artist and ceramics instructor Aimee Hunt holds a workshop for Orange County art teachers, focusing on the potter’s wheel and various glazing techniques. A day program for Intellectually Disabled Adults, share their drawings of pumpkins done in oil pastel on black paper. Artist Carol Barber and students at Wilderness Branch during the collage project held at each branch of the OC Public Library. Fiber artist Kimberly Radcliffe shares her knowledge and expertise of knitting with Orange County residents during one of the knitting sessions held at each OC Public Library branch. Woodworker artisan Christina Boy (not present) shares her unique take on toy wooden cars with Orange County residents at each of the OC Public Library Branches. Ceramicist Shari Jacobs worked with teens at each branch during summer Youth sessions through the OCPLibrary, creating one of a kind textiles on clay explorations. Painting of a tulip still life done during a Paint & Apple Cider Sip held at Visions, an adult psych-social day program. Author Renate Ruzich holds a book reading for her memoir, “Jumping Off the Devil’s Shovel”, in the Morin Gallery at The Arts Center, with E. K. Mellow acting as interpreter. Presenters, such as Anna Sawyer, leather bookbinding artisan, share their expertise with the public and with the senior residents at Dogwood Village of Orange County – Senior Living in the DVSL Community Room. Authors, historians, and musicians are among the local talent that provide varied topics, readings and performances of interest for all in the surrounding community. 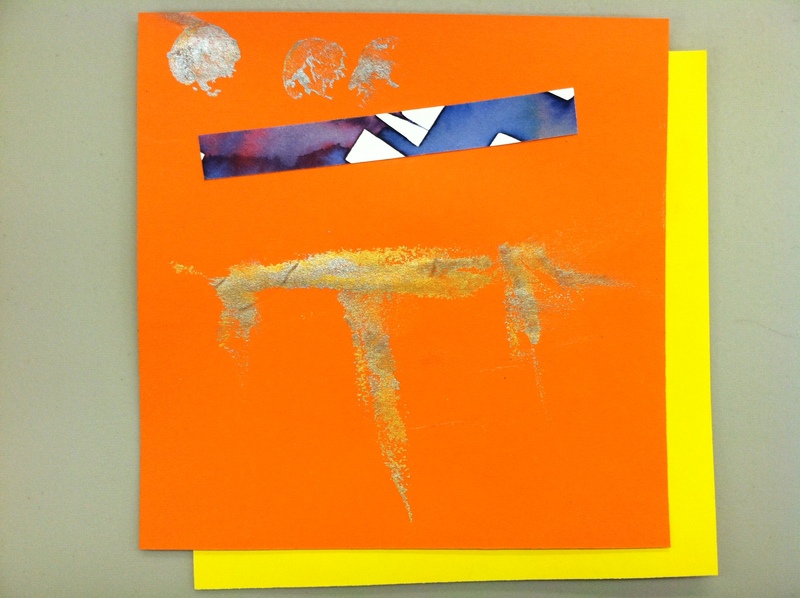 After choosing pleasing backgrounds of corrugated cardboard and thick, poster board templates, the artists explored line, color and texture by first using oil pastels to rub in the basic simple shapes. 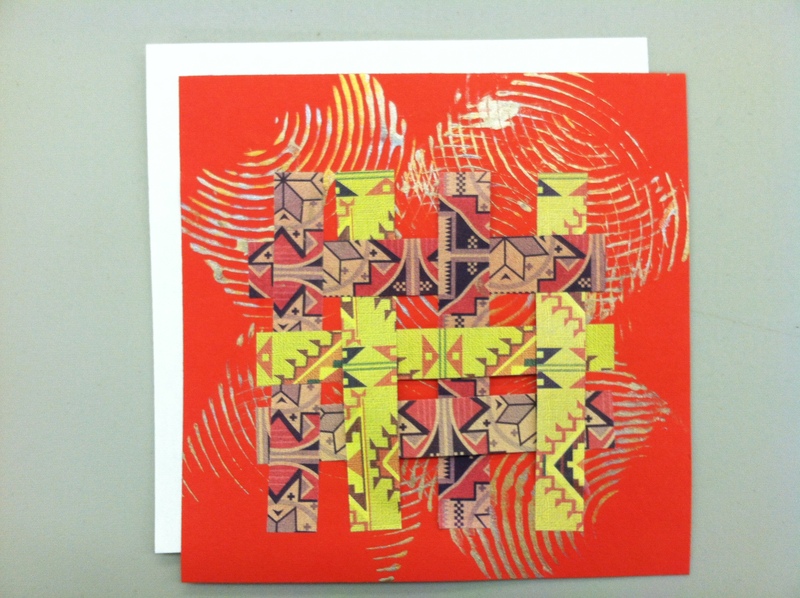 They then fine-tuned their piece with various shades and layered degrees of colored pencil applications. After viewing and discussing a few of Andy Warhol’s silkscreens, and commemorative Campbell’s soup cans honoring the artist, the members from Friendly Oaks explored painting a turkey in tempera paint, with a stylized twist! Hilary Holladay is a talented women: She is an published author – with a new novel poised and ready to be printed, a teacher, and a poet, among many other things! Sharing a reading from her novel, Tipton, followed by an in-depth question and answer session, was a moving experience for many of the reading’s attendees, as much of Holladay’s novel is set right here in nearby Rapidan. Tipton offers insightful views concerning interpersonal relationships and the inner workings of the human heart. 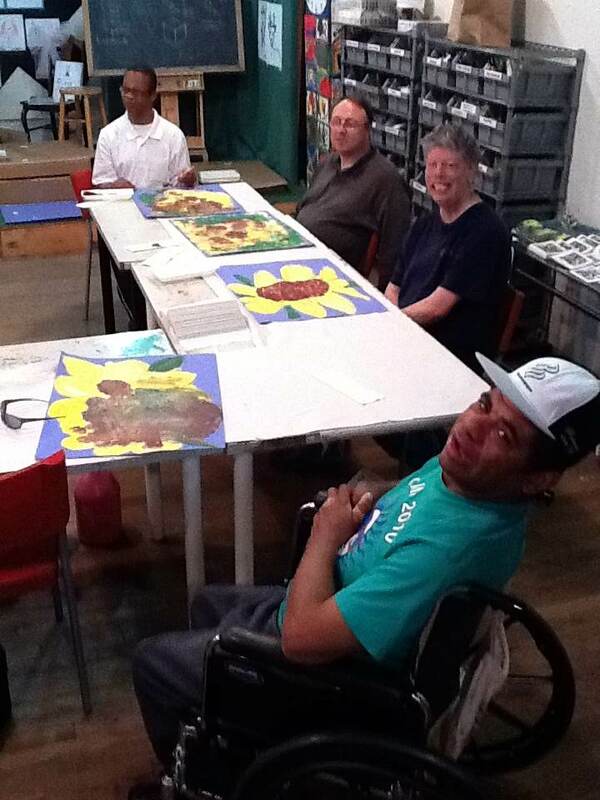 Friendly Oaks came for their monthly visit to the Art Center’s studio classroom, and rolled up their sleeves! In honor of the Autumnal Equinox, the Super Moon, and other astrological events, a study of the solar system was at hand. The world, and the surrounding galaxy that we live in, was interpreted in wonderful ways by the members from Friendly Oaks. It was a truly fun and well spent October afternoon sharing time with author, Suzi Weinert, during her book reading and Q & A session at Dogwood Village of OC – Senior Living. Weinert has published two novels and is working on her third for her Garage Sale Mystery Series. The Series was picked up by Hallmark and the first film, based on Weinert’s first novel, Garage Sale Stalker, was such a big hit that Hallmark developed a mystery channel due to the overwhelming interest in mysteries that the movie created! The series ran from September 2nd through October 15th, with both a ceramic session and a watercolor session being held at each branch of the Orange County Library system: The Main Library, Wilderness and Gordonsville branches. Watercolor artist, Maria Pace, and ceramicist, William Schran, shared their broad expanse of knowledge within their given fields with each person attending their sessions. It was a great success and the Outreach Program is looking forward to partnering again with the OC Library in the near future! Classes held at each branch of the Orange County Public Library system are happening this fall! 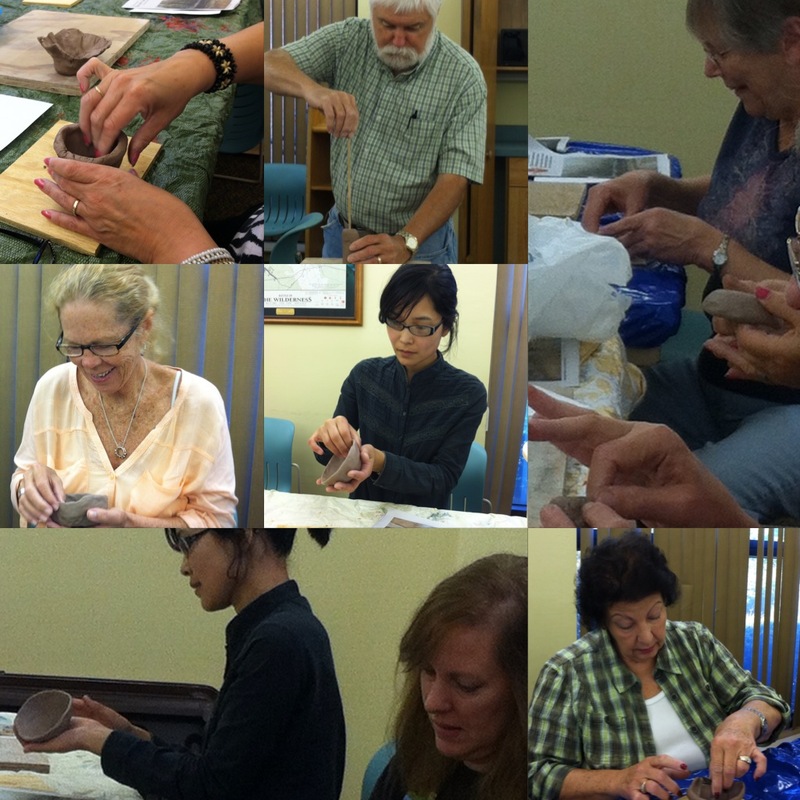 Watercolor artist, Maria Pace, and ceramicist, William Schran are holding introduction classes, sharing their expertise, county-wide. A group from Friendly Oaks, a psycho-social day program, through Regent Ten of Charlottesville, has been visiting The Arts Center, to work with Outreach on a monthly basis, exploring many different art projects. This last piece – acrylics on 12 x 18 white paper – was done by a member during the beautiful Virginian springtime, when the wild poppies graced the fields. Orange County Office on Youth School-Aged Day Program and Fish, Fish, Fish! With many fun and exciting activities planned for the members of the OC Office on Youth School-Aged Day Program, visits from the Outreach Program, and field trips to the Arts Center itself are included in the summer fun. 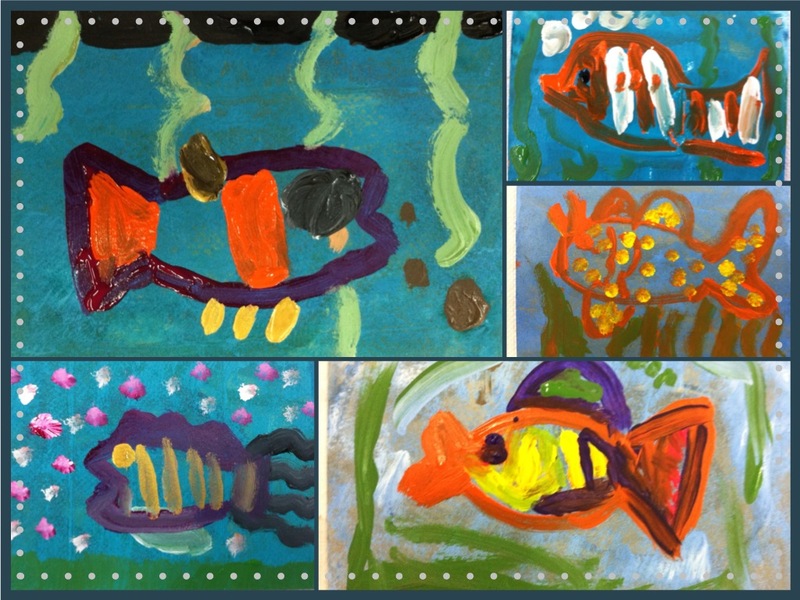 After studying the anatomy of the fish, each program member rendered their own idea of a fish in its watery world. The results: Fish, fish, fish! In acrylic paint on wood. Working within a mixed-media project, which included printmaking, watercolor and paper collage, these pieces stand at the opposite ends of the design spectrum. One piece, though abstract, holds simple, identifiable forms, while the other piece uses pattern upon pattern, and color upon color to form its abstract presentation. 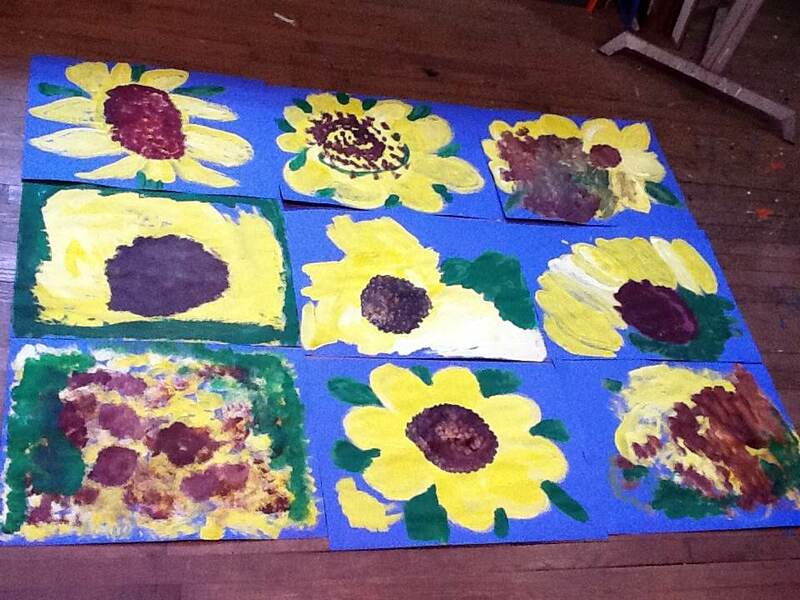 The members at Visions Clubhouse, a Psycho-Social Day Program through Rappahannock Rapidan Community Services, created these powerful pieces during an Outreach visit this summer. 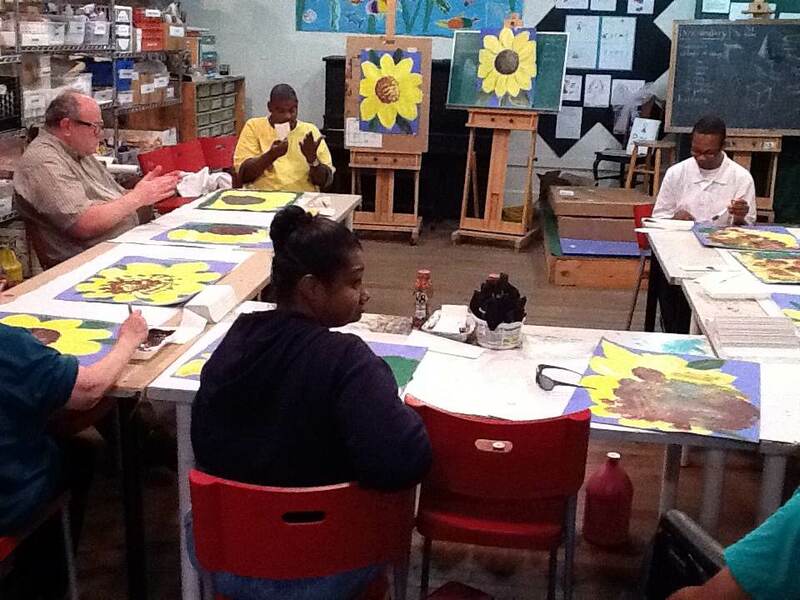 After viewing the Young Visions 2012 exhibit in the Morin Gallery, club members from Bridges painted sunflowers in the classroom studio at The Arts Center.